Let’s say your business is expanding, requiring you to also expand your existing warehouse operations—perhaps even relocate. It should come as no surprise that the costs of building out a new facility (including real estate, equipment, and labor expenses, not to mention regulatory compliance and potential downtime) are enormous. Many smaller operations simply cannot afford the investment, while large companies are challenged on many fronts in these situations. What can you do to increase usable area without leasing additional space or moving operations to larger warehousing facilities? Using mezzanines to create extra space is one option. There are a variety of mezzanine types that can serve as an alternatives to new facility construction. Depending on the needs of your operation, you’ll want to weigh the options – for example, structural vs. shelf/rack supported mezzanines – and determine what makes the most sense for maximizing unused vertical space, work flow processes, and, space beneath the mezzanine. Whether you’re using the mezzanine for in-plant offices, conveyor lines, as part of an integrated pick module, a high-density storage, work/assembly space, or any other purpose, it’s important to outline the intended use of the mezzanine to ensure you’re optimizing layout for proper space utilization. In other words, you want to make sure you’re setting the space up to allow easy movement of workers and materials, ideally creating a workflow that’s consistent with your other operations. Mezzanine planning and implementation should factor in platform weight capacity, but did you know that correct mezzanine specification starts on the ground floor? The typical floor in many regions has a capacity of 25,000 pounds, but you also have to take into consideration how much the soil underneath the slab will compress. To ensure you’re not putting too much weight or stress on the floor of the building when you install a mezzanine, do your research. This may involve working with your landlord or building architect to determine what kind of weight your floor is capable of handling. By getting the correct specifications in place in advance, you can avoid costly and/or dangerous scenarios down the line and maximize mezzanine space. While even the most detailed projections for the future aren’t a crystal ball, it’s important to think ahead about how your facility needs may evolve. One of the key benefits of mezzanines is their flexibility; a mezzanine can be enlarged or moved if it becomes necessary to accommodate a new facility layout, for example. 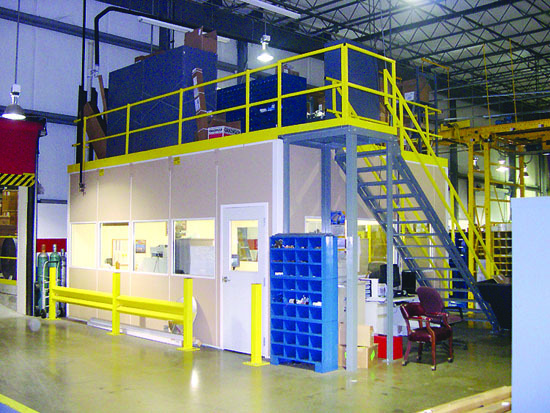 Structural or free-standing mezzanines are an attractive option for many facilities because (most of the time) they can be assembled, moved, and reassembled for other applications—even in an entirely different facility Also, structural systems may not be subject to some aspects of building codes, if they are specified correctly. Integrated mezzanines, on the other hand, offer the highest load-bearing capabilities, which allow warehouses to store and move heavy loads off the floor. It all depends on the specific needs of your facility – and what you can reasonably expect or predict those needs to become in the future. In both cases, mezzanines allow you to take advantage of existing infrastructure, HVAC, and other resources. Businesses are increasingly turning to mezzanines to squeeze every inch of useful space out of a facility, save on new construction costs, and to add flexibility to plant structure. The above are just a few ways facilities can make the most of their mezzanine investment, resulting in increased efficiency and productivity across the warehouse. How does your organization take advantage of the vertical space afforded by mezzanines? I’d love to hear your thoughts in the comments below.